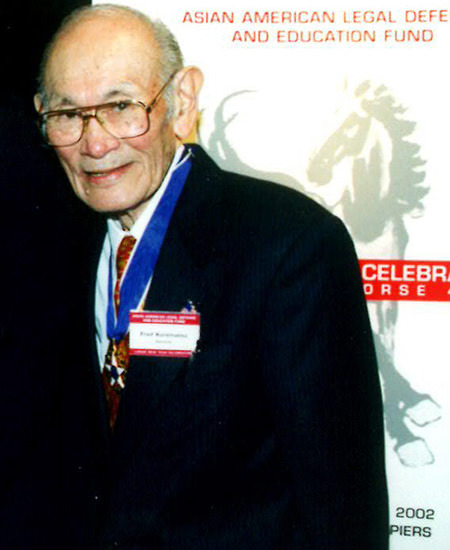 Fred Korematsu would have been 96 on Friday, January 30, and if you don’t know him, you should know why he’s important. Even if you do know Korematsu’s basic story, you might be surprised by some details here. There was nothing easy about what he did. It’s been just four years since the inaugural Fred Korematsu Day celebration was established on his birthday–the first time an Asian American has been so honored in California. For what Korematsu did, he should be more appropriately regarded a national hero on the same level as Martin Luther King, Jr.
FK as MLK? Anyone who has seen “Selma” understands what MLK did for African Americans. Korematsu was every bit a symbol for the fight against transgressions against Asian Americans. Korematsu was just one man, and not a movement. But you’d be hard pressed to find in a single person someone who embodies the fight for democracy, freedom, and justice for Asian Americans more than Korematsu. In 1942, when he was just 23, Korematsu saw other innocent Japanese Americans rounded up by the U.S. government to be incarcerated in a camp, and simply decided he would not go. That’s the shorthand hero version. The twists in the Korematsu story show how he is still relevant today. According to the award-winning documentary Of Civil Wrongs and Rights: The Fred Korematsu Story, Korematsu was on a date with a Caucasian woman at the time of the Pearl Harbor bombing. He saw himself as an American and didn’t think his country would do anything to him just because of the war. Wrong. His U.S. government soon regarded him as the enemy because of his race. Korematsu defied the internment order for a while, and even had plastic surgery to see if that would allow him to look more Caucasian and avoid scrutiny. But his ultimate arrest was accompanied with sensationalistic media coverage. The slur “Jap” was used to describe both Asians and Asian Americans. The news coverage of Korematsu’s jailing caught the eye of the Northern California ACLU’s executive director Ernest Besig, who decided to make Korematsu the test for the constitutionality of the internment. The case went all the way to the Supreme Court, with the government arguing against the 14th Amendment and justifying the internment of Japanese Americans as a “military necessity.” Critics have said the Court seemed unwilling to go against the government and President Roosevelt, which might explain why civil rights stalwarts like William O. Douglas and Hugo Black were part of a 6-3 majority against Korematsu. Korematsu lost. Ultimately, he would spend time in an internment camp. But he also found that not only was he shunned by general society and his country at war, he was also shunned by other Japanese Americans in camp who believed he should have shut up and cooperated. It only took 40 years to be vindicated. In 1983, Prof. Peter Irons, a legal historian, discovered government memos that were kept from the Supreme Court in 1944. The documents revealed an internal struggle within the government on how to present the case. Would it go with the Army’s contention that Japanese Americans were a threat to national security? Or would it also present information from the FBI and other military intelligence that contradicted the Army? The suppressed information was enough for a group of attorneys, mostly young Japanese Americans, to reopen the case and overturn Korematsu’s conviction in 1983 in a federal district court in San Francisco. But it was far from a total victory. Because the government declined to appeal, the 1944 Supreme Court decision remained untouched. Korematsu’s crew of young lawyers couldn’t get back to address the high court. But is that enough? Minami told me it would be ignorant for anyone to use _Korematsu _as a precedent today for the wholesale imprisonment of people because of their race. But then what do you say to all those post-9/11 incarcerations of Muslims at immigration holding cells from New York to Guantanamo? What about the proclivity of the government and law enforcement to use racial profiling? It’s not far-fetched to see how xenophobic zealots without a knowledge of history could easily misread Korematsu, even though the lower court conviction was actually vacated. And so the Supreme Court case remains dangling out there for a zealot to abuse. But it forces us to keep Korematsu’s memory alive and make his lifelong fight our perpetual battle for civil rights. Just look at Selma, and the battle for voting rights. Fifty years later, there are renewed efforts that are organized and well-funded, whose sole aim is to dismantle the Voting Rights Act and to disenfranchise minorities and the poor. If we’re not vigilant, we soon will be marching backwards faster than forwards. That’s why not just Asian Americans, but all Americans, can ill afford to forget Fred Korematsu. FK all the way, every day. Not just on Jan. 30, but all year round.